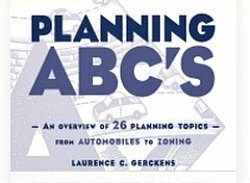 Planning and zoning officials have powerful influence over the future shape and land use of our communities. Making sure we leave our children and grandchildren livable communities and a livable environment is reason to consider planning and zoning a approaches that move toward sustainability. A sustainable society is one where human needs -– ours and those of future generations -– can be met within the capacity of the earth to support those needs. At present, trends of human activity -– including development, consumption, population growth, and degradation of natural resources –- both at global and local levels, are heading increasingly in directions that are unsustainable. At the same time, more and more communities are redirecting planning and zoning to help shape development and land in more sustainable directions. We can learn from their examples. To better understand what sustainability means, it helps to step back and take a look at the big picture. Two broad trends can be seen. First, the natural systems around us are being depleted at a rate faster than they can be renewed. Second, population growth and consumption are continuing to rise. It should come as little surprise that Americans lead the world in resource consumption and waste generation. These two trends are like the sides of a funnel, converging upon one another. The time we have to stabilize these trends is diminishing. And we don't know at what point irreparable damage will occur. 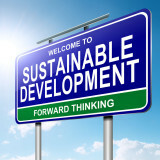 Two paired phrases often used in discussing sustainable development are: "upstream causes" and "downstream effects." Planning and zoning strategies that address the root causes of land use and environmental issues are said to deal with "upstream causes." In contrast, strategies that focus on remedying (or managing) existing problems deal with "downstream effects." The connection is that by taking preventive measures -– that is, by dealing with what creates environmental and land use problems in the first place (i.e., "upstream causes"), one can often avoid the more costly and intractable steps needed to remedy land use problems after they occur (i.e., "downstream effects"). Traditionally, most land use and environmental regulations have focused on managing downstream effects. For example, regulating hazardous, toxic substances usually takes the form of controlling their on-site storage and disposal. In contrast, an upstream approach might encourage alternatives to the use of toxic chemicals, thereby avoiding the need to deal with storage and disposal concerns. Likewise, efforts to deal with traffic congestion usually take the form of widening streets, adding lanes, lights, or other mitigation measures. An upstream approach might instead focus on developing strategies that work to reduce the volume of traffic, eliminating the need for dealing with congestion.